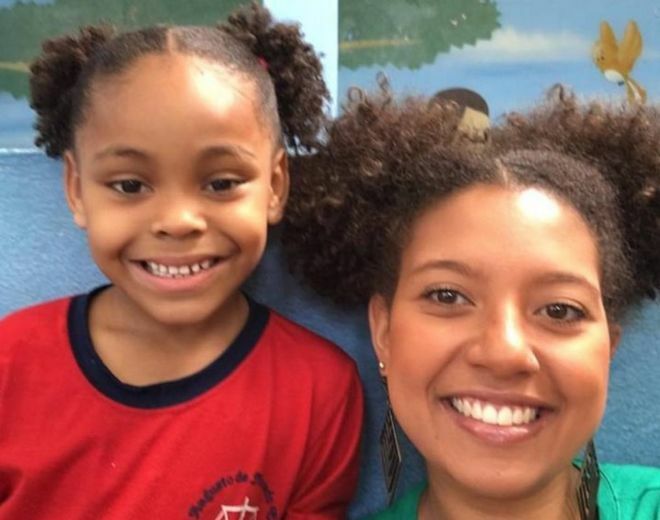 A Brazilian teacher has come up with a unique way to help a schoolgirl who was being bullied because of her hair. Ana Barbara Ferreira, from Sao Paulo, said her student was "sad" after being ridiculed by a boy, who had said her hair was "ugly". "At that moment, the only thing I could tell her was that she was wonderful and shouldn't care about what he was saying," she wrote in a Facebook post that went viral. A bigger show of support came in the following day, when she went to work wearing the same hairstyle as her pupil, much to the girl's surprise. "When she saw me, she came running to hug me and say that I was beautiful," Ms Ferreira said. "I told her: 'Today I'm beautiful like you!'"